Silver chain with lapis lazuli, diameter of the pearls about 3mm, sold by 20cm, at the end of the Middle Ages, lapis lazuli began to be exported to Europe, where it was powdered and transformed into ultramarine , the most beautiful and the most expensive of all the blue pigments. The ordered chain delivered in one piece. Chain in gilt silver with black spinel stone, in size of 3mm, sold by 20cm slice, this chain will be cut according to the quantity ordered, for example 1m ordered a single chain of one meter delivered. Sterling Silver Chain with Quartz Fumé qsuare. Bead diameter: approximately 11mm. Length of chain: 50cm. (7 pieces). Sterling Silver Chain with Prasiolite qsuare. 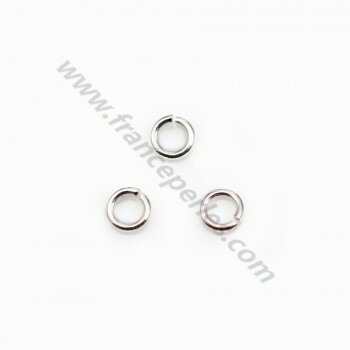 Bead diameter: approximately 11mm. Length of chain: 50cm. (7 pieces). Silver chain with Turquoise reconstituted. Bead diameter: approximately 3-4mm. Length of chain: 20cm. Gold Plated Silver chain with Turquoise reconstituted. Bead diameter: approximately 3-4mm. Length of chain: 20cm. 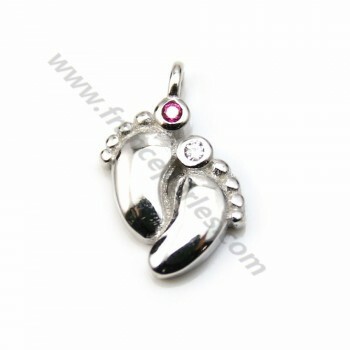 Silver chain with Garnet. Bead diameter: approximately 3-4mm. Length of chain: 20cm. Gold Plated Silver chain with Garnet. Bead diameter: approximately 3-4mm. Length of chain: 20cm. Silver chain with Black Spinelle. Bead diameter: approximately 2-3mm. Length of chain: 20cm. 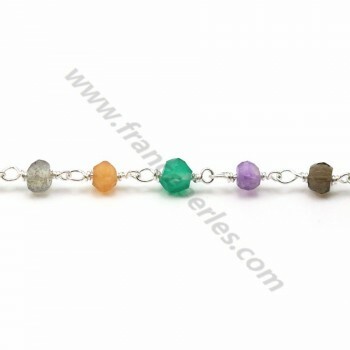 Silver chain with prehnite stones, 2 * 3mm x 20cm, it is a stone that helps to accept the hidden truths and to work on it. 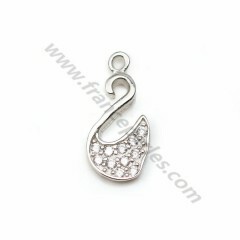 Diameter of pearl : 2*3mm; chain length : 20cm. 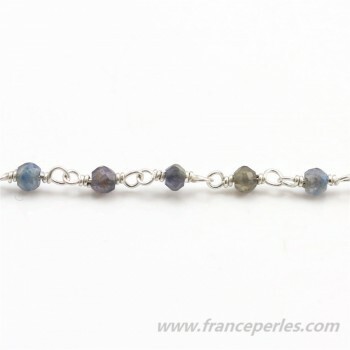 Silver chain with Iolite. Bead diameter: approximately 3-4mm. Length of chain: 20cm. 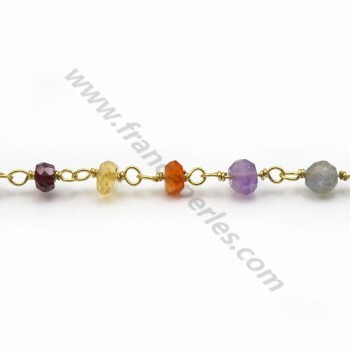 Gold Plated Silver chain with Iolite. Bead diameter: approximately 3-4mm. Length of chain: 20cm. Silver chain with Amethyste. Bead diameter: approximately 3-4mm. Length of chain: 20cm. Gold Plated Silver chain with Amethyste. Bead diameter: approximately 3-4mm. Length of chain: 20cm. Silver chain with rose quartz . Bead diameter: approximately 3-4mm. Length of chain: 20cm. Silver chain with rose quartz . Bead diameter: approximately 4-5mm. Length of chain: 20cm. Silver chain with Carnelian . Bead diameter: approximately 3-4mm. Length of chain: 20cm. Gold Plated Silver chain with Carnelian . Bead diameter: approximately 3-4mm. Length of chain: 20cm. Silver chain with Green Agate. Bead diameter: approximately 3-4mm. Length of chain: 20cm. Gold Plated Silver chain with Green Agate. Bead diameter: approximately 3-4mm. Length of chain: 20cm. Silver chain with Tourmaline. 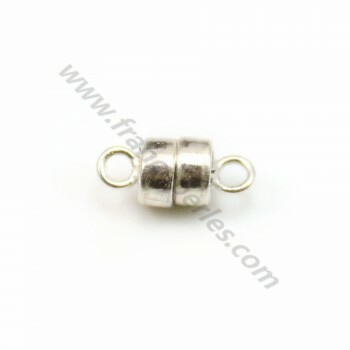 Bead diameter: approximately 4-5mm. Length of chain: 20cm. Chain in silver gold with tourmaline stone, diameter of pearls about 3mm, chain diameter 20cm, they were used by chemists in the 19th century to polarize light by light rays on a cut and polished surface of the gem. Silver chain with mixed stones, 2.5 * 4mm x 20cm, on this thread you can find as well: carnelian, peridot, spinel, amethyst, green agate, moonstone etc. Diameter pearl : 2.5*4mm, chain length: 20cm (sold in one piece). Chain in silver gold with mixed stones, 3*4mm x 20cm, on this son you can find as well: cornaline, peridot, spinel, amethyst, green agate, moonstone, etc.. Diameter pearl : 3 * 4mm, chain length: 20cm (sold in one piece). Silver chain with Citron Quartz .Bead diameter: 2-3.5mm. Length of chain: 20cm. Gold plated silver chain with Quartz Lemon . Bead diameter: 3-4mm. Length of chain: 20cm. Silver chain with peridot. Bead diameter: 3-4mm. Length of chain: 20cm. Silver chain with Quartz. Bead diameter: 3-4mm. Length of chain: 20cm. Silver gold chain with freshwater pearls 3mm x 20cm, they are the only beads not to possess "mother bead" or "nucleon" as matrix in their heart. All the pearl in its entirety is formed by the mollusc, and is therefore entirely formed of mother-of-pearl produced by the mollusc. Diameter of pearl : 3mm ; chain length : 20cm.